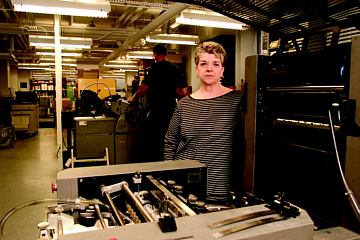 Ann Grattan, manager of Printing Services on the Homewood campus. Editor's note: This is part of an occasional series about in-house resources available to the university community. For previous stories, go to www.jhu.edu/gazette. Whether you need 50 multicolor invitations printed on brown fiber paper or 50,000 black-and-white copies of a letter, the university has in-house offices that can get the job done at inexpensive rates. 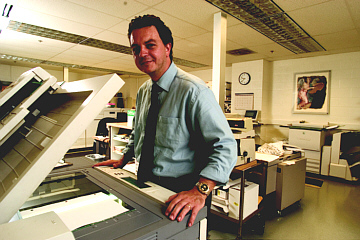 Johns Hopkins' oldest and largest print and copy operation is Printing Services, a division of the Office of Design and Publications. Founded in 1954, it was originally called Duplications. Located in the basement level of the Homewood campus's Wyman Park Building, Printing Services today offers a host of copying, printing and binding services. It handles jobs small (a box of business cards) to mammoth (100,000 copies of a letter to prospective students). Printing Services ranks University Administration as its biggest client, but it offers full services to faculty, staff and students in all university divisions. Ann Grattan, Printing Services' manager, said that while the majority of its work is done for Homewood-based clients, the office has regular customers at the East Baltimore campus, Bayview Medical Center, Peabody Institute and the School of Advanced International Studies in Washington. In terms of printing, Printing Services can produce documents up to four colors and of various shapes or sizes. With new digital machines, the office can turn around in hours projects that used to take five to seven days to complete. The service works on more than 5,000 jobs annually, producing, among others, event programs, stationery, invitations, benefits announcements, business cards, newsletters, certificates, course packets and labels. It also does many kinds of bindings, including tape, saddle-stitching, GBC and coil. Grattan said Printing Services can handle nearly any project size, but if a job is not geared to its equipment, it outsources it to preferred vendors. September and October are Printing Services' two busiest months, she said, as the nine-person staff works around the clock to prepare course materials and flex-plan benefits documents. "We work a lot of weekends during that period," she said. "In general, we work weekends and holidays if need be. We realize people need their jobs finished by a certain day, and we do whatever it takes to meet that deadline." While most university offices have their own basic copy machines, the in-house copy services at Johns Hopkins offer the latest in copying technology, with lightning-fast digital machines that can produce one-sided and two-sided copies, booklets and stapled projects. Documents can also be stored to memory, so an entire job only has to be scanned in once and can be reprinted later with a touch of a button. In East Baltimore, Steven Cawunder heads up Reprographics, whose biggest duplication jobs are policy and procedure manuals, research grants and patient forms. The Applied Physics Laboratory has its own print and copy shop, called the Print Facility. It offers black-and-white and color copying, graphics services and digital printing. For graphics, the facility offers digital and OCR scanning, color manipulation, image combing and complete page assembly. Standard jobs include technical publications, manuals, handbooks, brochures, newsletters and stationery. It can also create and maintain internal and external mailing lists and print labels. There are two facilities on the East Baltimore campus-located on the fifth floor of the School of Public Health and on the seventh floor of the 1830 Building-that provide solely copying services for university and hospital employees. The largest printing and copy center on the East Baltimore campus is Reprographics, a nearly 50-year-old service. 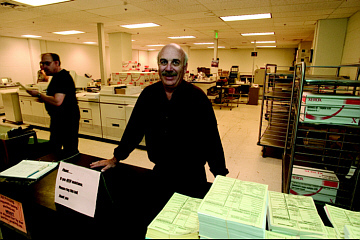 Manager Steven Cawunder, who has worked at Reprographics for 32 years, said that his office typically handles duplication of such documents as patient forms, policy and procedure manuals and research grants. The average turnaround time for a project is 24 hours, Cawunder said, and his prices are typically lower than at a Kinko's or similar print or copy shop. Andrew Foster, manager of the School of Public Health's Copy Center. "We are here only to meet cost, not turn a profit, so we can offer significant cost savings to our university and hospital customers," he said. Largest project? Cawunder said his office used nearly half a million pieces of paper on a job this year for the hospital's Department of Human Resources. Printing Services' Grattan says that while many of the university campuses have retail print and copy shops nearby, there are benefits other than cost savings for sticking in-house. "We know how to do these particular jobs and can prioritize. We know how people want their finished project and can usually can get it done faster," she said. "Perhaps above all, we have a track record. And, if you're on the Homewood campus, we'll also deliver right to your desk, free of charge." GO TO AUGUST 2, 2004 TABLE OF CONTENTS.